At Ambler Dental Care, patients discover comprehensive, compassionate dental care in a spa-like environment designed to eliminate fear of sitting in the dentist’s chair. Walking through the doors of Ambler Dental Care may have you questioning if you’re in the right place. You can smell the essential oils in the air. The waiting area feels like a friendly living room, with complimentary coffee, tea, and water. And the warm greetings from the staff put you immediately at ease. Suddenly, being at the dentist doesn’t feel quite so scary. Now, the examination rooms are outfitted with two 40-inch TVs, one on the wall in front of the chair, and one on the ceiling. Once seated, patients are offered “a comfort menu” from which they may select lip balm, a blanket, or a neck pillow, and headphones for listening to music or watching TV—even Netflix. Dr. Jashank says because patients often feel so relaxed with their blanket and headphones, it’s not unusual for them to doze off. But that doesn’t interfere with the dental work. After treatment, patients are offered a warm scented towel to wipe their face, allowing them to leave the office feeling refreshed and ready to go back to work, out to complete errands, or wherever the day takes them. The whole experience resembles the hospitality industry than it does a dentist’s office. Drs. 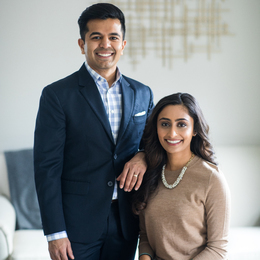 Jashank and Komal earned their dental degrees from the Kornberg School of Dentistry at Temple University. After graduating, they pursued and completed a six-month implant continuum training course, furthering their ability to provide the most innovative treatment for prosthodontics and restorative and cosmetic dentistry. Only 5 percent of dentists in the country complete this course, according to Dr. Jashank, who is a member of the American Dental Association and the Academy of General Dentistry. He has also been declared an Elite Preferred Invisalign Provider, among the top 5 percent nationwide. Technology and convenience rank high on the list of priorities at Ambler Dental Care. Because the doctors offer a wide range of services under one roof, patients have no need to go from specialist to specialist to complete their treatment. The practice provides dental cleanings, in-house fillings, crowns, root canals, dental implants, minor sinus lifts, and various cosmetic services, including teeth whitening and Invisalign. As part of their treatment plan, the doctors utilize the latest digital X-rays, which have the lowest amount of radiation, and intraoral cameras so a patient can see what the dentists see. Additionally, the office provides the option for family block appointments, which allow parents and their children to be seen during the same visit. Something that has become increasingly popular at Ambler Dental Care is the “smile refresh.” Overseen by Dr. Komal, this treatment option addresses neglected teeth or visible cavities using options such as dental implants, crowns, and veneers. Patients can play a vital role in the creation of their refreshed smile, by choosing the custom shade and shape of their new teeth. She recalls one of the first patients whose smile she helped transform. Drs. Jashank and Komal hope to extend their services and compassionate care model beyond the walls of their Ambler office. Dr. Jashank has traveled to Nepal twice on dental mission trips, providing people in remote villages with vital dental care. The team at Ambler Dental Care has a goal of one day in the near future establishing a clinic in India. Even so, their focus on improving dental health locally will only intensify. The practice has seen an influx of new patients and is working to train new dentists and staff to provide the same level of care Drs. Jashank and Komal have established.